I’ve been a fan of Allie Condie for a long time now. So I was very excited to start reading the advanced copy of The Darkdeep, by Allie and Brendan Reichs, as soon as I received it. Unfortunately, that was also the time of my mother’s hospitalization, and the book got lost in the shuffle following my mom’s passing. I recently uncovered a pile of “summer” books, and The Darkdeep was there. The book is the first in what looks to be a promising series. Everyone in Timbers knows Still Cove is off-limits, with its creepy Beast sightings and equally terrifying legends. But when a bullying incident sends twelve-year-old Nico Holland over a cliff and into Still Cove’s icy waters, friends Tyler and Emma — and even Opal Walsh, who usually runs with the popular kids — rush to his rescue . . . and discover a mysterious island hiding in the murky, swirling mists below. 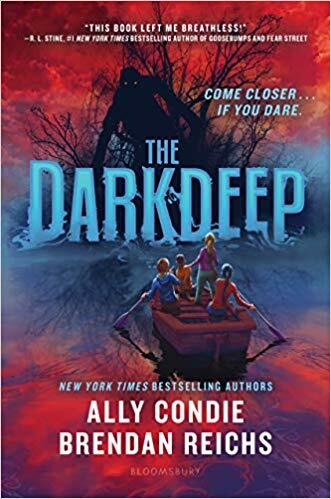 The Darkdeep is well-written mystery/fantasy/adventure that moves so smoothly you’d never guess there were two authors involved. The story is told from alternating points of view that add dimension to the overall story. The book is fast-paced and definitely worth your time.